Your website is the face of your business and internet users want it to show up almost instantaneously when they click into it. In fact, most users expect websites to load in no more than two seconds and just a one-second delay can lead to a huge drop in sales. Can you even imagine? If a second or two can make such a huge difference to your bottom line, what would your site being inaccessible altogether do? If your website is down (or taking ages to load), you can kiss your chances of getting any sales or leads goodbye. Not to mention it’s simply horrible for your brand. It’s not just about first-time visitors. Even the more loyal ones or regular customers will get irritated and go searching for an alternative. It doesn’t matter what industry you’re in or what you’re selling, customers will go to your competitor. That is the reason it’s so important to prevent website downtime. Today we’ll dive into all the different ways downtime hurts you, some of the main reasons why it happens from a technical perspective, and what you should do about it as a WordPress site owner. We’ll also include some tips on how to prevent it altogether. Why is Downtime Bad for Your Website? How to Deal with Website Downtime? Some might think an hour or two of downtime in a month is not all that bad. But let’s spend some time talking about what can happen if your site goes down unexpectedly. If your server is slow and takes more than two seconds in fetching a single URL, Google might limit the number of URLs it crawls from your website. Simply put, Google likes to crawl fast websites and those that don’t have errors. Also, don’t forget that downtime or a slow server response will result in a higher bounce rate. User experience is one of the many ranking factors Google uses and a high bounce rate indicates poor user experience. When it comes to SEO, everything impacts each in other in some way or another. If you have extended periods of downtime, which is not uncommon on shared hosting, your search engine rankings might suffer and you’ll have to work your way back into Google’s good graces to recover. This can take time. eCommerce is definitely something everyone is used to nowadays but customers can still be a little wary of making online purchases. So, if your site is down or slow during peak hours, you give visitors an excuse to jump ship and leave mid-purchase. Worse yet, if your site goes down when a visitor is thinking about buying something you can nearly guarantee that the downtime will cut into your profits by considerable margins. According to Carbonite, average downtime costs per minute for small businesses range from $137 to $427 per minute. If we take a look at a study by Gartner of bigger companies, the average cost of downtime is $5,600 per minute. And for Amazon, just a second of downtime costs over $220,000 dollars. Obviously, this will all vary based on your business, but you get the picture, it’s not good. A website can crash or go down for many different reasons. Below we will discuss some of the most common ones we see. A low-quality web host is one of the most common reasons a site has downtime. There’s no point in investing in your website design, UX, or site speed if your web host is not–if you’ll pardon the pun–up to code. The most common of these is shared hosting. Shared hosts include some of the largest in the industry, such as EIG companies like Bluehost and HostGator as well as providers like Siteground, GoDaddy, and InMotion Hosting. These providers usually use cPanel and charge between $3 to $20 a month. The reason “shared” hosting is bad is right in the name itself. These providers tend to overcrowd servers and even though you don’t know it, your site is sharing resources with 200+ other people. Any issues that pop up with other sites can trickle over into your site. This, in turn, impacts your site’s performance and uptime. Shared hosts rely on upsells and add-ons to make a profit, not the quality of hosting they provide. If you’re curious to learn more about this, check out this in-depth article from our CFO on the truth about the economics of the web hosting industry. Want to go viral? We all do. But it doesn’t always work out the way you want it to. Do you remember that famous Oscar selfie? It was retweeted more than 3 million times in less than 24 hours, crashing Twitter’s website on its way to becoming the most-retweeted photo of all time. An abnormally high rush of visitors or activity can result in 500 errors on your website, or worse, a full site crash. Check out how Kinsta helped DARTDrones prepare for what we call the Shark Tank effect. Our infrastructure can easily handle thousands of concurrent visitors. Many shared hosts limit your website by server processes, number of connections, CPU usage, memory, database queries, etc. Going over these limits when a surge of traffic hits can result in the provider simply taking your site offline or temporarily suspending you. They have to do this to protect everyone else on the server. That is the flaw with shared hosting. This results in lost revenue for every moment your site is down. At Kinsta we don’t ever want to take your business offline. For many of you, your website is your primary source of income. That’s why if we notice a problem we’ll instead proactively reach out to you before doing anything. You shouldn’t be penalized for being successful, and that’s why we primarily only limit your site by PHP workers (a much more logical approach). If you’re running a blog or more static WordPress site that is primarily serving from cache, you’ve usually got nothing to worry about. If you’re running an eCommerce, membership, or community site; these are typically more resource heavy and have a lot of uncacheable content. This is where the number of PHP workers becomes very important. Check out the do’s and don’ts for hosting WordPress membership sites. Not all activity is “good” activity. A sharp uptick in site visitors doesn’t always mean that your website has suddenly become the talk of the town. Bad bots and proxy traffic have been known to bring a WordPress site to a crawl. A Distributed Denial of Service (DDoS) attack can also result in high activity and lead to a site crash. Similarly, hacking attempts can mess up your website and result in unavailability. It’s important to take basic precautions like using the latest version of WordPress and updating plugins (and the latest version of PHP) as soon as new versions are released. You should also use a strong password and change it every once in a while, too. Make sure you check out our ultimate guide on WordPress security. At Kinsta we have many security features in place to prevent anything bad from happening to your website. Things such as GeoIP blocking, automatically banning IPs that have more than 6 failed login attempts, along with hardware firewalls, make it hard for hackers to get passed. But on the off chance your site is compromised, we’ll fix it for free! We also recommend utilizing a professional grade Web Application Firewall (WAF) such as Sucuri and Cloudflare to protect your WordPress site. 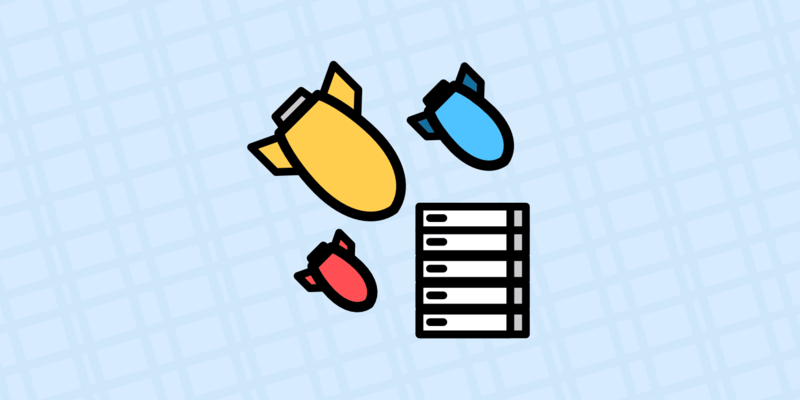 A WAF sits in between your website and our Kinsta servers, stopping the bad traffic from ever reaching you. This helps to ensure your website stays up at all times. This is also a very cost-effective way to keep your visit counts down on your hosting plan. Easy availability to thousands of themes and plugins is one of the strongest points of WordPress, but sometimes it turns into a weakness. A theme or plugin has to be compatible with your WordPress version and the technology used on your web host. We recommend starting off with our hand-picked list of the best WordPress plugins. Unfortunately, no matter how good the plugin is, one bad update can bring your WordPress site down. Common problems include the white screen of death and 500 errors. Always check your website immediately after making a change. Most of the time, upgrades or new installations will go smoothly but glitches can still occur and you don’t want those glitches to be discovered by your visitors before you do. Better yet, this is exactly why we have automatic daily backups, manual backups, and staging environments at Kinsta. Got plugin updates? 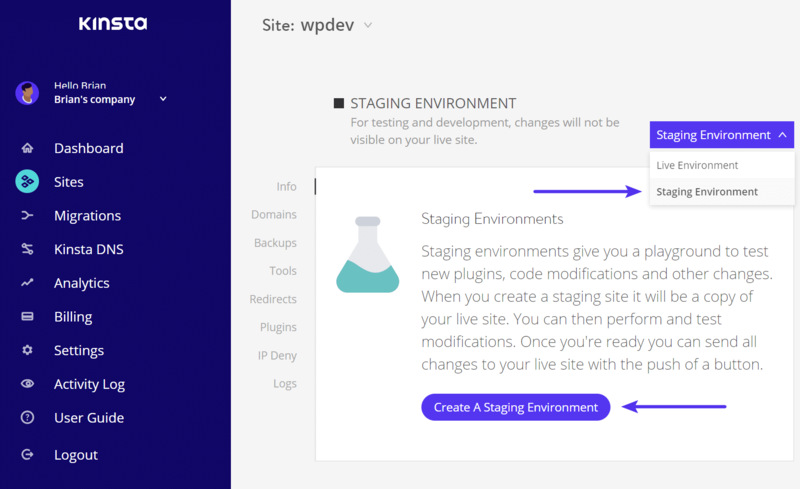 Clone your production site to staging with a click of a button, run all of your updates, and then test out the site. If you’re good to go, you can push the changes back to production. Or use our manual backup option. Take a quick backup of your site before running updates and if you run into a problem, simply roll it back to the previous version. You might also want to think about waiting to update your plugins and themes until the new versions have been out for a little bit. We recommending checking the changelogs to ensure there is nothing security related. Security updates should always be applied right away. Besides new versions and updates causing problems, you could also have performance related issues with plugins and themes. We see this happening a lot! One example would be a plugin querying an external service which times out. Or another would that the plugin isn’t coded properly for speed. 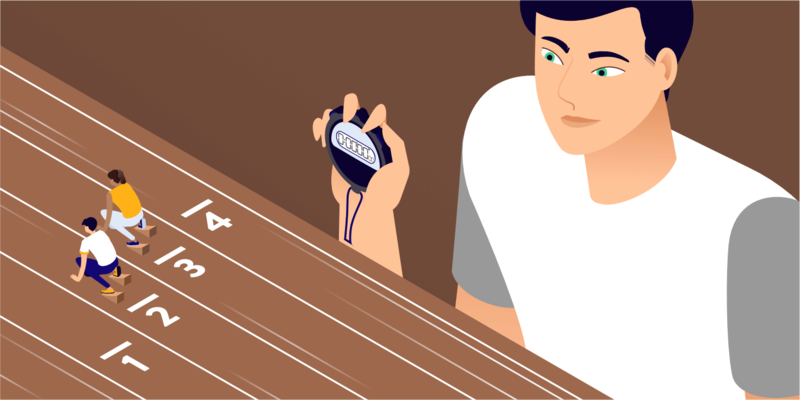 Check out our post on analyzing third-party performance on your WordPress site. 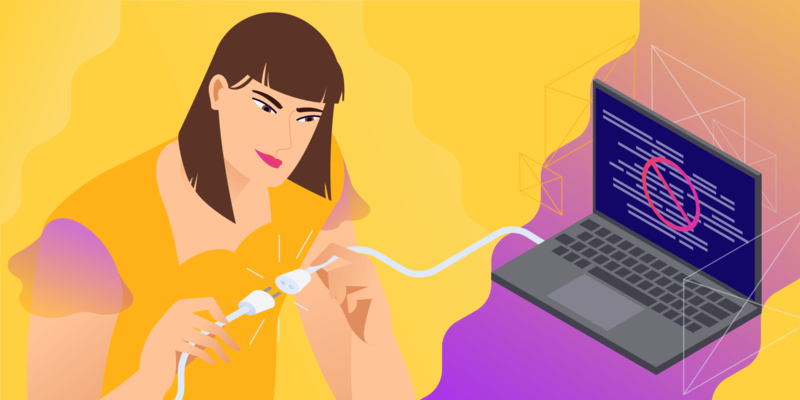 We’ve already shared a lot of applicable tips above, but let’s dive into a few more ways to deal with website downtime to ensure the highest possible rate of availability for your WordPress site. 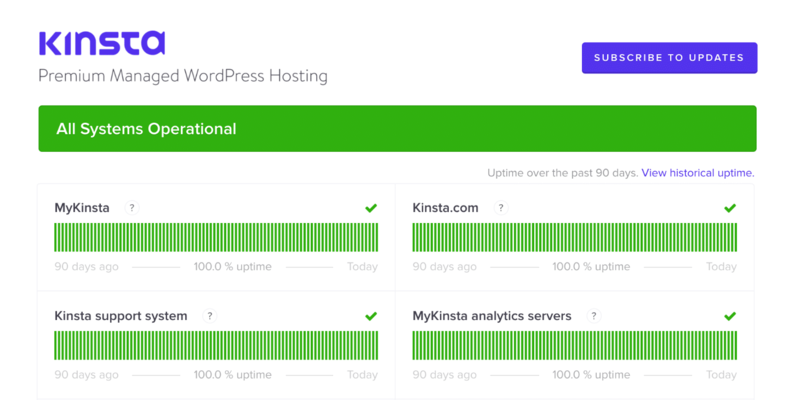 If you’re a Kinsta client, we monitor all of your WordPress sites for you. We check the status of each site every 2 minutes. That translates to 720 checks for each of your sites every day. You can rest assured knowing that if for some reason your website does go down, our support team is probably already on the case! 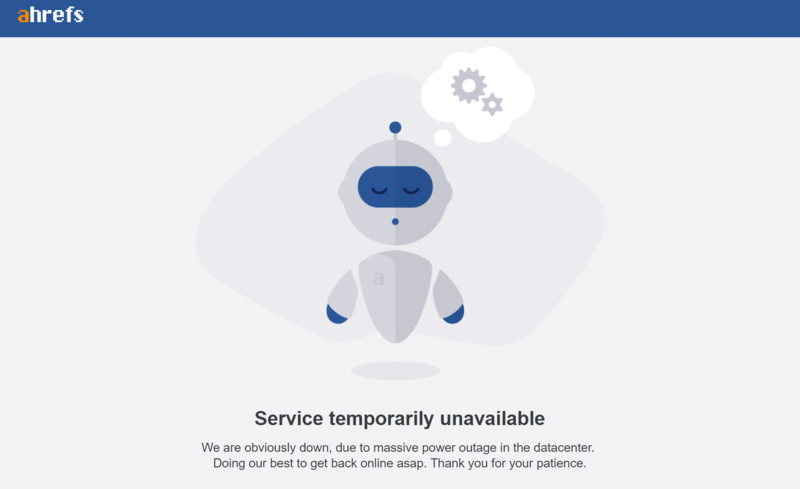 We also have a status page (hosted intentionally by a third-party) which allows clients to subscribe and automatically get notified of system disruptions that are impacting our website, the MyKinsta dashboard, or our hosting platform. If you have planned downtime or still have access to your site, you should set up a downtime page. This helps inform your visitors that you’ll be back soon and that they won’t simply see a blank page. A “website maintenance” or “service unavailable” page with a short message shows that you are in control of the situation and helps to restore credibility. Here are a few good examples from Ahrefs and MailChimp below. Or you could use a third-party service like Statuspage.io. You can also check out some more great ways to extend maintenance mode on your WordPress site. Whenever anything goes wrong, especially when its downtime, social media is the first place customers go. Figuring out new ways to calm people down has pretty much become a new art form for social media managers. Sometimes lightening the mood can help. Here’s a great example below of how ScandiKitchen handled their downtime. Another approach is to simply apologize and try to offer assistance via other platforms such as DMs on Twitter. Whatever you do, always be open and transparent about your website’s downtime. Social media users can smell a cover up a mile away! As I mentioned earlier, using a low-quality web hosting service is often the biggest culprit for site downtime. We of course always recommend going with managed WordPress hosting. Especially if you don’t have the technical know-how or a full-time webmaster to deal with technical issues. How much is your time worth? Good hosts will not only deal with the server side problems but their technical support will be able to identify the problem a lot more quickly and offer solutions on-the-spot. Thanks to the flexibility afforded by the use of a container-based infrastructure, proactive load management by our Engineering team, and the use of a best-in-class cloud provider in Google Cloud, we are able to offer an SLA-backed 99.9% uptime guarantee. Also, check out how Kinsta is different. When it comes to user experience and conversion optimization, every second counts. While you’re working to ensure a near-100% uptime for your website, you must also work on improving your website’s speed. If your website is taking over 10 seconds to load, it’s pretty much as good as down, because the majority of visitors will be clicking away long before it loads completely. You can do everything in your power to prepare, but you’ll probably still at some point experience site downtime. Sometimes, it’s just the luck of the draw. The unforeseen can happen at any time so it’s important to always have backups ready to go! Luckily, making regular backups is extremely easy with WordPress. Most hosting services provide this option and there are plenty of WordPress backup plugins out there to also automate the process. Having a backup ensures that your website will be up and running in next to no time. Sometimes website downtime is inevitable. That’s why it’s important to be prepared and have the proper tools and services in place to make sure you get back up and running as fast as possible. Not only will this keep you from losing revenue, but will improve the overall impression you make with visitors and potential customers. Did we miss anything important? What have you done to reduce your website downtime?